11 1/4 x 9 1/2 in. 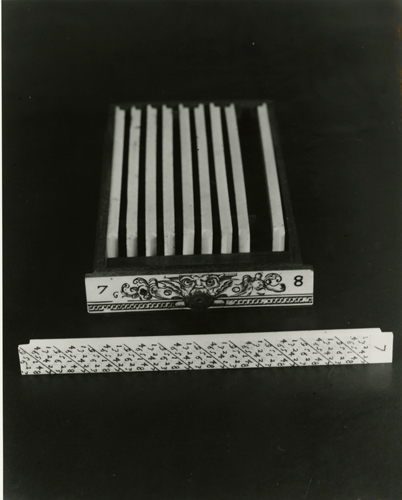 This is a black and white image of a drawer against a black background with nine of Napier's abacus cards resting inside. One slot is empty inside the drawer as one card is laid out in front of the drawer in the foreground. The drawer is labeled "7" and "8" and has cloud drawn in a shape of a face on the front. The card in front is labeled "7" and has a series of numbers. There are 10 diagonal black lines drawn on the card. Written on the verso side in blue pen is "4631" and in black pen "10/1, p.60". Also written in verso side in pencil is "E.Tomash Figure 10". There was a "14" written but has been crossed off. Written on on the white label is "PROPERTY OF ANNALS OF THE HISTORY OF COMPUTING 133 McBryde Hall Virginia Tech Blacksburg, VA 24061-0119".